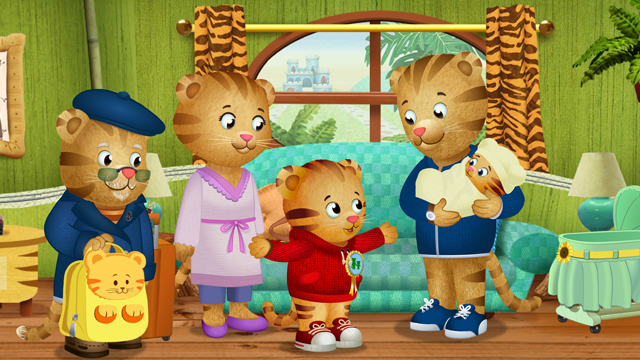 A whole new season of Daniel Tiger’s Neighborhood, the top-rated animated television series from The Fred Rogers Company airing nationally on PBS KIDS (check local listings), kicks off on Monday, August 18, 2014 at 11am, with a very special one-hour show – and an adorable brand-new addition to the Tiger Family, Daniel Tiger’s little sister, Margaret! 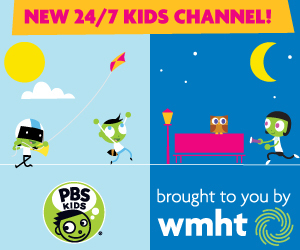 In the upcoming special and in two additional engaging episodes to debut during the week, viewers nationwide will get to meet the baby, as Daniel and his family explore key themes of welcoming a new sibling – like being excited, feeling left out, and adjusting to changes in routines, among other important topics for families in neighborhoods everywhere. Monday, August 18 – One Hour Special! The Tiger Family Grows: The Tiger Family is expanding and Daniel finds out that he is going to be a big brother! At first, he isn’t sure what to expect, but as his family prepares for the arrival of the new baby, Daniel learns about what it means to be a big brother…and a big helper, too. Daniel Learns about Being a Big Brother: The new baby is almost here and the Tiger Family is getting ready for the new arrival. Daniel is eager to pitch in as Mom and Dad prepare the baby’s room, but struggles with the idea of giving up his old baby things for his new sibling. He soon realizes that being a big brother means letting go of things you no longer need, and that’s a big help for the whole family. The Baby is Here: The baby is about to arrive and everyone is so excited! Mom and Dad head to the hospital while Daniel and Grandpere spend time at home going through some of Daniel’s old things. In this half-hour musical episode everyone welcomes the new addition to the Neighborhood as Margaret comes home! Strategy:I can’t wait to meet the baby! Time for Daniel: Daniel is playing “adventure tiger” at home with Dad, but things are not quite the same, now that Margaret is around. Daniel is upset that Dad keeps having to take care of his little sister, but Daniel learns that there’s time for the baby and time for Daniel, too. There’s Time for Daniel and Baby Too: Daniel is still getting used to having the new baby around. When Prince Wednesday comes over to play, Daniel gets frustrated because his friend wants to play with the baby instead of him, until he finds that there’s time for the baby and time for Daniel as well. And what’s even better is when they all play together! Strategy:There’s time for you and baby too! Playtime is Different: Daniel is having fun playing “restaurant” with O and Katerina, but they keep getting interrupted by a very curious Margaret who wants to be part of the action. She also can’t seem to keep her hands off of Daniel’s beloved Tigey! Daniel eventually learns that although having a new baby sister around is very different…it can also be really fun. The Playground is Different with Baby: Daniel is playing “circus” at the playground with his friends, but Margaret keeps making things different. Mom and Dad encourage Daniel to find a way to include Margaret, and Daniel discovers that playing with her can actually be even more fun! Let the circus parade go on! Strategy:When a baby makes things different, find a way to make things fun.